HUB Network Game Show Fall Premieres! “The Hub” network which was launched in October of 2010, has built a reputation for providing fun family entertainment. 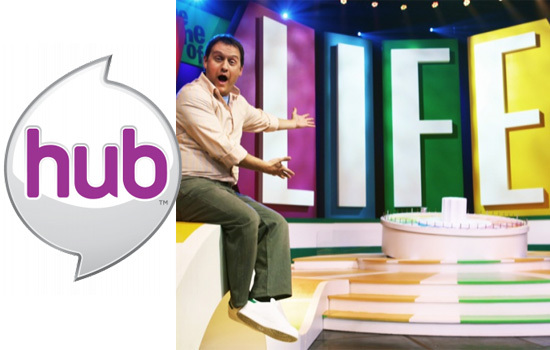 Making it clear from the start, Hub’s first original show was a real-life version of Hasbro’s ( network partner) board game “The Game of Life” one year ago. This Fall season, the hub is bringing it back, along with two other popular family games all premiering tonight! Tonight’s premiere of “The Game of Life”, airing at 6 pm (ET) will be followed by “Scrabble Showdown” at 6:30 pm ET. It’s an all-new, half-hour Hub Original Series “Scrabble Showdown.” Kids and parents use teamwork to solve a variety of challenging word games and puzzles that test their speed, spelling and vocabulary for points and prizes including the chance to win family vacations to anywhere in the world. Hosted by Justin Willman (“Hubworld,” Food Network’s “Cupcake Wars”) and produced by Hasbro Studios, “Scrabble Showdown” debuts tonight, September 17 at 6:30pm ET.